Multi-package Shipping allows a shipment to be split into 2 or more packages and either share a single tracking number or have an individual tracking number for each package. 1) Select the order you would like to ship. 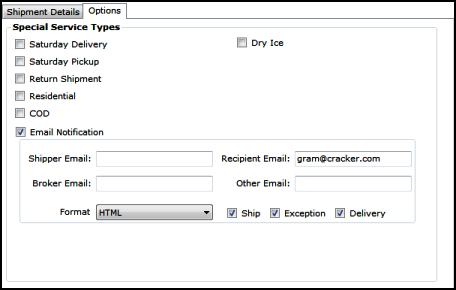 Then in the service area, in the drop-down menu “# of packages” select a number greater than 1. Notes: If the box “Same details for all packages” is checked then the same tracking number will be used for the multiple packages. 2) If the box “Same details for all packages” is not checked an additional area will be shown to add unique details to each package. Options: These are additional shipment options that can be added to any shipment. These options can also be selected as default shipping settings.